We went on a run tonight. It rained all day today, and after going out for brunch, grocery shopping, and sitting through a VHS copy of “The Princess Bride,” we decided to go for a run. 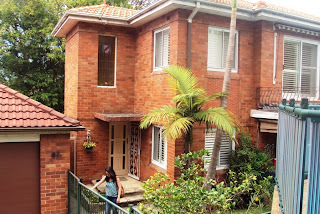 I checked GoogleMaps.au, and figured out a route extending 2.5 kilometers from the house we’re staying. We changed into our designer DryFits™, I took the house key off my key chain, laced up my 3-year-old running shoes, and we were off. Exercise is a climate-specific enterprise, and no time during this trip has the difference in mine and Luisa’s current residence been more apparent than today’s run. Luisa still lives in San Francisco, which is freezing right now. I live in Apia, which is ungodly hot and humid this time of year. And here we are in Sydney, which provides an (un)happy medium. My body cried for the first half the run, and I finally crawled “uncle” when we got to the turnaround. See, as profanely hot as it is in Apia, the humidity makes the air rich with oxygen. By the end of a run, I’m sweating a small estuary and my cheeks are hot enough to heat Helsinki for a day, but my lungs are all smiles. Despite Samoa’s lack of emission standards, I can breathe easy. Here in the cold weather and dry climate the air can’t hold nearly as much oxygen, and my poor alveoli burned as the run continued. My spoiled lungs aren’t used to this whole “do more with less” concept, and though my body enjoyed the cool climate and the opportunity to run without all the sweating, my chest screamed. Luisa was the opposite. When, at the turnaround, I whined about the cold, she only responded by rolling her eyes. A rainy early January evening in Sydney is far warmer than an uncharacteristically temperate January night in San Francisco. For Luisa this weather is hot—almost to the point it was unbearable. But we kept on, each of us a refugee in our own personal anti-climate. This area, the lower north shore, is quite hilly, which only added insult to our respective injuries. My body whined as I sucked as I took the deepest breaths I could to supplement the thin air. Luisa seemed dazed by the heat. Crossing the finish line (at the end of the driveway), we were both clearly zonked by the run, though for completely different reasons. Whatever. Props to us for running in the rain. 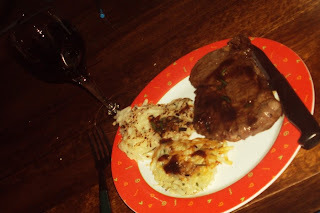 Steak, red potato hashbrowns, and red wine for dinner. 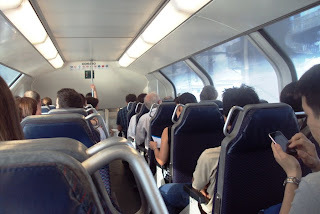 Taking the subway from Sydney to North Sydney on Wednesday. 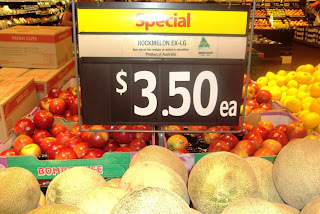 Ruane and her family introduced me to the way Kiwis and Aussies refer to canteloupe as "rockmelon," but it all seemed like a slightly strange family quirk until it was confirmed in the produce section at the local supermarket this afternoon. Rock melon is an awesome name for a melon. Ten times cooler. I vote for adoption.